Frances Bell's Blog by Frances Bell is licensed under a Creative Commons Attribution-NonCommercial 3.0 Unported License. Based on a work at www.francesbell.wordpress.com. #OER16 Can we imagine tech Infrastructure as an Open Educational Resource? Or, Clouds, Containers, and APIs, Oh My! I have always loved libraries. The first one that I remember is Withington Library from when I lived in Withington in Manchester as a child. It’s great to see it is still there and operating as a community hub. When we moved to Middlesbrough, I became very excited that I could join two different libraries and double the number of books I could borrow. I longed to be 12 so that I could join the adult library. The first floor reference library looks pretty much as I remember it though we didn’t have bands performing there back in the day. Funnily enough, university libraries tend not to be among my favourites even though I know how important they are for resources and as study venues for students. Manchester has two beautiful libraries in the city centre, each of which has had a facelift in recent years. John Rylands Library was built by Enriqueta Rylands as a memorial to her late husband (Manchester’s first multi-millionaire) and opened on the first day of the 20th Century. 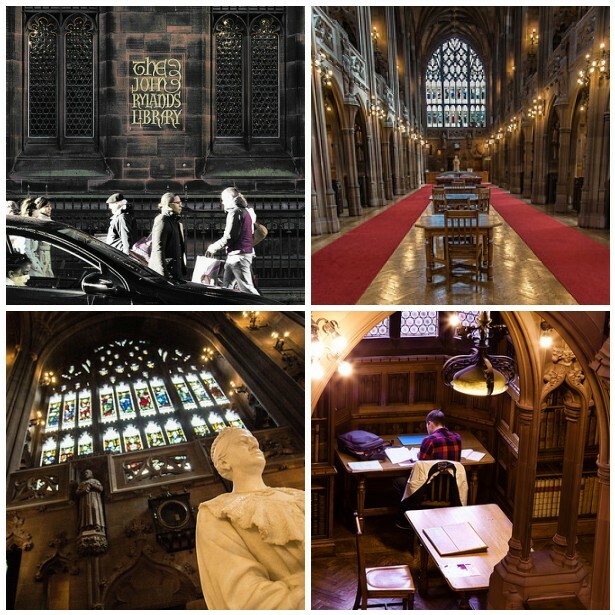 It feels like a cross between a museum and a church and, as well as offering archives and services for librarians and researchers, it has a reading room that offers a truly lovely workspace that I worked in last week . The silence is almost loud. Manchester’s Central Library reopened recently and I have visited it twice but feel that I have only just scraped the surface. 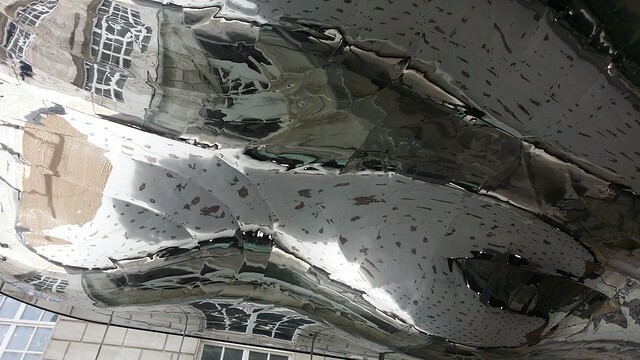 It has a spectacular new entrance that connects it to the Town hall, with a dimpled reflective ceiling that throws off dynamic and fractured images. The cafe is in the heart of the ground floor right next to interactive multimedia resources that offer a way into physical archives at various Manchester libraries.The ground floor offers connected social spaces that open into each other. On my first visit, I could hear a performance for the Manchester Jazz festival across the other side of the building. So let’s celebrate public libraries and defend them from funding cuts. We still need public spaces where people can learn independently with guidance from librarians. They are as important now as they were at the time that Roberts (1971) wrote about in his classic work about Salford slums in the early 20th Century. Roberts, R. (1971). The classic slum: Salford life in the first quarter of the century. Manchester: Manchester University Press. I think that you have tapped into something here Len. When I look at what I have written about my pleasure in libraries it was outside my ‘official’ roles as student or academic. Part of it is leisure and part about voluntary ‘work’ that my retirement has enabled me to do. What a wonderful post, Frances — I am a long-time library-lover also. My favourite space is the Rose Reading Room in the main branch of the NY Public Library (5th Ave & 42nd St). The room is sadly closed for restoration at the moment, but what an inspiring space to sit in, work in, simply be in. Here’s a link to the library page about the Rose Reading Room http://www.nypl.org/about/divisions/general-research-division/rose-main-reading-room and here’s one of my photos taken there a couple of years ago http://www.nypl.org/about/divisions/general-research-division/rose-main-reading-room. I have been thinking about public good like education and parks and libraries – we lose them at our peril. Sadly there is a story about the Manchester Central Library about the exclusion of a home less person. If I return to New York, I will try to visit that library Catherine – thanks. Hi Frances – I love libraries too. Unlike Len, I even have happy memories of my undergraduate university library days – Sheffield University – where I used to hand write my essays referring to huge text books – no computers in those days. Also a University library was quiet in those days. I’m one of those people who needs silence to be able to work, so University libraries these days are a bit of a nightmare for me. One of the most impressive libraries I have even been in is Alexandria Library. There are some photos in this Flickr album – https://www.flickr.com/photos/jennymackness/albums/72157605630496641 – very modern, so the opposite of some of the examples you have. I have been there fairly recently but these are not my photos.